You are currently browsing the tag archive for the ‘volcanoes’ tag. Early this morning, Pembleton received a phone call from the International Society of Animal Vulcanologists. Mount Fuego in Guatemala had erupted with almost no warning! The society had evacuated most of the local animals, but there were still several families missing. Pembleton, thinking that Ducky would just get in the way, snuck out of the house and headed to the airfield where his plane was being prepped for takeoff. Several minutes into the flight, Pembleton heard strange noises coming from the copilot’s compartment. Looking behind, Pembleton found a round ball of fluffy feathers rifling through his lunchbox. “Where are all the good snacks?”, Ducky asked. 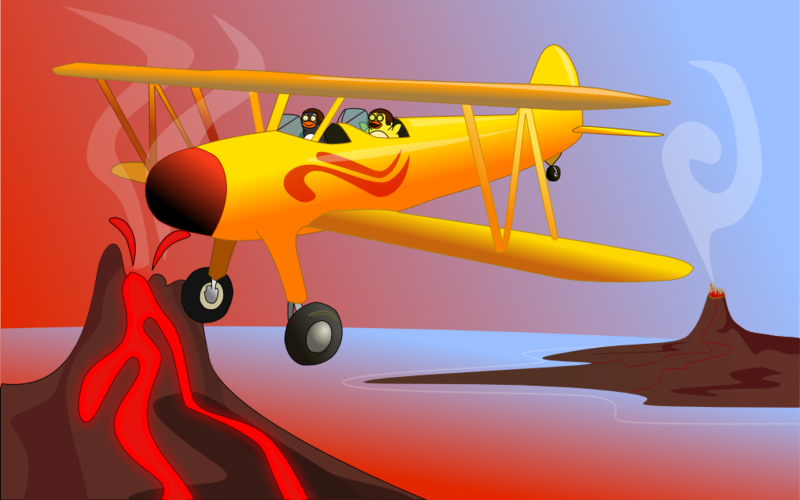 Ducky and Pembleton raced towards the volcano where they were able to help rescue all of the missing families near Mount Fuego. After a hard days work, Ducky and Pembleton enjoyed PB&J sandwhiches and headed home. Pembleton never let Ducky fly the plane. This story is dedicated to our little panda buddy at the National Zoo, who sadly passed away today. Flying to the rescue over Mt Fuego.